The Northern District of the Tucson Mountains is a surprisingly wild and rugged litte wilderness with some exceptional desert peakbagging and bushwacking. 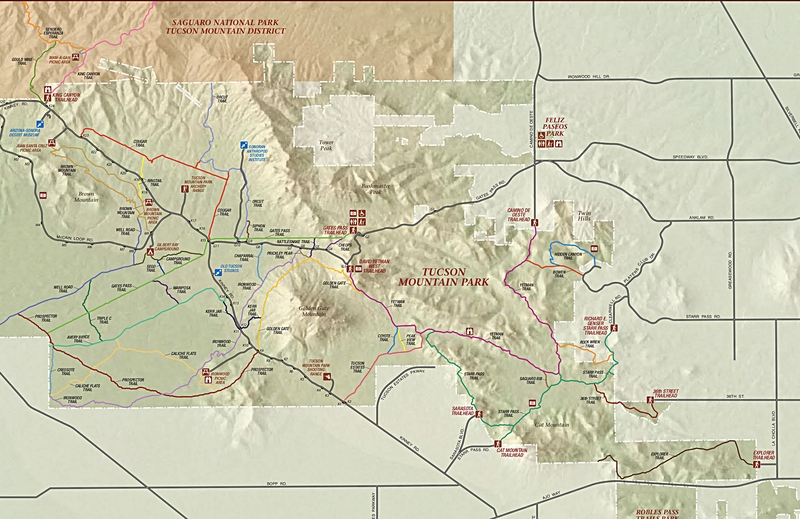 I hike here a lot and today I finally put together what I call the North Tucson Mountains Superloop. It takes in mostly off-trail peakbagging of some of the prominent local landmarks and offers a rugged, relatively short adventure. Start this from the Sanctuary Cove, which I have fully described in my write-up of Safford Peak. This trip will start with a climb of the (locally) infamous Safford/Sombrero Peak. You can't go climbing around here without a trip up Safford. Mark your spot when you climb up the Southern face of the ridgeline before making the final ascent up the western backside of Sombero. After bagging Sombrero head back down to the ridgeline where you can see off to both the north and south, Panther Peak is to the west. From the ridgeline head west to the next, close small peak and summit that. Get a lay of the land and a feel for where you want to go. The goal is to drop down and to your left until you reach relatively flat ground on the northern side of the deep canyon south of the Safford Ridgeline. There is no trail and no correct way to go. Just be patient and have a plan for where you are headed. You will intermittently see Panther Peak, but not always. You may occasionally cliff-out a little, but there is always a safe alternate way to go. I had to seriously bushwack one time, and only for a very short distance (less than 100 feet). Keep heading west and cross over a couple of wide gulleys. You want the last gulley west to start climbing up. The good news is that this is such a small area overall you can usually see where you want to go and you can't really get lost. So scramble away. At the last gulley climb up. I crossed over to the west side and climbed up the small shelved peak to the far southwest of the formation. You can now look south at the ridgeline of Peak 3262, east at beautiful Sombrero Peak and immediately east and slightly south at Panther Peak. These views are just brilliant. Head back down and across the nearby gulley, to bag Panther Peak next. This is very close and will only take 10-20 minutes. There is no trail, but all you need to do is go up, until you can't anymore. Enjoy the views from Panther. From the top of Panther you can actually pick up a use path, that seems fairly well-defined and follow it down the peak. It will eventually head east to a saddle between Panther and the Safford Ridgeline. From here you can follow a well-cairned faint path the STEEPLY climbs down the north face of the Northern Tucson Mountains Ridgeline. Follow this out into the northern foothills desert. You can now easily see where you want to go...straight east to the small ridgeline running north and south. There are two saddles in it you can use as landmarks. I scrambled out towards an obvious fence marking the northernmost park boundary. Here you can pick up a well-defined horse trail that runs east to the destination ridgeline. Follow this quickly. It will end at the fence marking the park boundary. Cross through the gate and follow an old road until you are parallet to the more northern of the two small saddles. This is your destination. Scramble across the desert to the northern flank of the small gulley leading up to the saddle. You may pick up another well-defined horse trail on the way up. Pass through a gate at the top. From here follow the trail south for about 10 minutes and you will soon see Sanctuary Cove and the parking lots. There are a maze of trails here. I followed them when they seemed helpful and scrambled when I felt that more appropriate. You will end up in the Sanctuary Cove parking lot to complete your Superloop. I did not include many distances because your routes are going to be different than mine. The total trip is about 7 miles with much up and down. A GPS, compass or just a good knowledge of this small wilderness are needed. Have fun in my "backyard" wilderness. 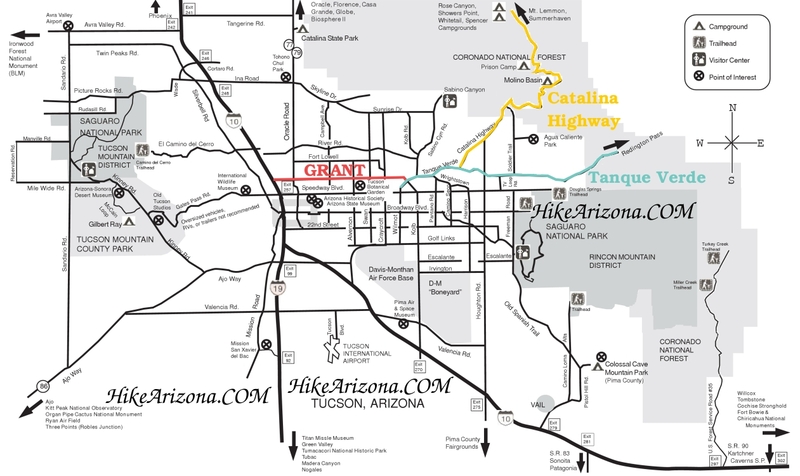 Please note that the accumulated elevation gain is much more than the elevation gain for climbing Safford alone (the trip highpoint) as you will bag three peaks on this trip. 2012-02-12 Caretakers sanctuary cove write: Sanctuary Cove parking lot is for guests visiting the chapel and grounds. Parking for the peak is down scenic drive in the turnaround space. Any cars with guests hiking off the property will be impounded. 2012-06-24 anonymous writes: Greetings! Sanctuary Cove is no longer the parking area for the Safford Peak hike. There is a turn out on the right side of the road a short distance before the entrance to the Cove. This is where to park now. If you park at the Cove you risk having your vehicle locked in if you are not back by the time the gates are locked - which is at sundown. However there is a short hike at the Cove where you are welcome to park your car for that one.